Ellicott Hospitality, a division of Ellicott Development, is proud to sponsor the 2015 Buffalo Bills Jim Kelly Club Season Ticket Giveaway. This contest running now through July 30, 2015 at 11:59pm is a great opportunity for you to experience the upcoming season. 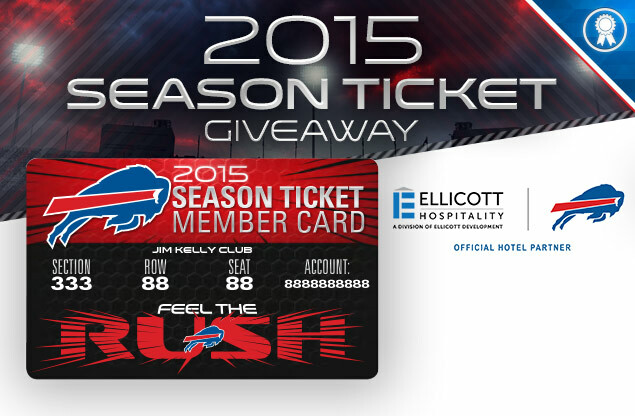 The winner will receive four 2015 season tickets for seats in the Jim Kelly Club. The Jim Kelly Club is the biggest of the three “Sideline Clubs” available at Ralph Wilson Stadium and is located on the second level of the visitor’s side. The giveaway winner will also have access to exclusive club amenities such as upscale concessions, in-seat beverage services, climate controlled lounges, and private club facilities. Fill out your entry on the Buffalo Bills website.